Given the number of plastic sandwich bags discarded every year (20 million), parents who pack lunches for their kids can easily go a little greener by replacing those baggies with reusable lunch bags. With an ever-growing number of options, however, the harder part is choosing which reusable bags to buy. Now, there’s a locally based option called LunchSkins that was created by three DC-area moms. Made from imported food-safe pastry-bag fabric, which makes them moisture-proof and durable, LunchSkins come in three sizes: snack, sandwich, and sub. Even better news for brown (or should we say “green”) baggers? A portion of LunchSkin sales are donated to local environmental organizations including the C&O Canal Trust and Chesapeake Bay Foundation. I recently gave the snack and sandwich bags a test run during a week of my kindergartner’s lunches, using them to pack everything from dry foods (cookies and pretzels) to gooey (peanut butter and jelly sandwiches). They are easy to clean–either by turning inside out and rinsing, or putting through a dishwasher cycle. LunchSkins kept the foods contained, just like a plastic baggie, and my 6-year-old found them easy to open and close, even with their heavy-duty Velcro closures. 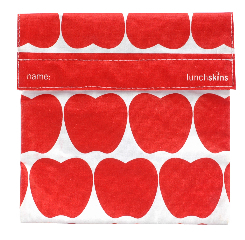 LunchSkins aren’t made for truly wet foods, however, so for anything juicy I’ll stick to our bento boxes. I also plan to get the third size bag, the “sub,” for those days when we pack bigger or taller items. So I’ll add a couple of bags for myself, too. They’ll add flair and eco-friendliness to my lunch–and this summer’s beach and picnic trips, too.